Niigata Prefecture, on the Northwestern coast of Honshu Island, facing the Sea of Japan, is home to one of the richest rice-growing regions in the world. It is also an area that experiences unrelenting winters featuring annual snowfalls rivaling anywhere else on the planet. (Back in 1986, the town of Yuzawa received a Biblical dumping deeper than 7½ feet in one day!) Niigata, along with other prefectures along the Japan's Western seaboard, is also known for a peculiar musical tradition dating back four centuries. pretty interesting stuff. as a westerner, i can't help but see this as the japanese counterpart to the blues. Two weeks ago, I received an email in the middle of my Friday radio show. I had just cued up the first song in a set of Japanese music (during the fourth set of this program) but I didn't have time to read it. Only after I made some announcements and then started the first track of the set did I have time to read the message. It was from a listener who was responding to an email I'd sent almost three years ago to the day answering a question the listener had. This listener, Kota, was all apologetic for not having seen my response -- it had gotten lost in an old mailbox or something -- and to make up for this, Kota sent along an MP3 (the Goi Yamamoto song, above) with a brief description of the music of the Goze. Kota likened the sound to Son House and that REALLY caught my attention! I clicked on the MP3, was blown away, and had the track playing over the air within minutes. After a couple of back-and-forth emails with Kota, I've wound up with MP3s of two amazing CD collections of Goze music. (All thanks, of course, to Kota.) Wow! By "Sea of Japan" I assume you mean "East Sea". Goze is coming to your house now! Yeah, this stuff is mind-blowing. Loving it. Thanks, Doug (and Kota). wow Doug-- wonderful stuff! I wonder if it is the same as something I heard many years ago from a tape of a wkcr show, japanese female vocalists doing some minimal soul music. I can still remember the melody, but never know any info. Thanks for telling me the story. I believe it's cool if this music could be an opportunity to think about souls & blues everywhere around the world, not only western world. It would be cool to get some translations. Chinese folk music, and American via Africa folk music share a kindred spirit. It's that old pentatonic scale, the blues scale. All those fake Hollywood chinese scores use the black keys on the piano. Ask Hoagy Charmichel. Ah heck, forget about the piano. Ask Blind Lemon Jefferson. No, Blind Lemon Jefferson is Americanish Goze, Lightnin Hopkins,too. Originally the guitar & the piano came from Europe, much older from Islamic culture. The pentatonic scale is came from Scotland. The mother of the blues from Africa was all killed. Who kills? Martin Scorsese's blues film is too easy for me. I'm just a listener, not a scholar. I just respect the music of Kikue Sugimoto, Nic Jones, Son House, Nusrat Faten Ali Khan, Bernardo el de Los Lobitos, Atahualpa Yupanqu, and of course Blind Lemon Jefferson is great. Amazing stuff. Thank you for the information and the background for the post. Absolutely fascinating. Impressive! I'm looking for more Mikawa Manzai. Is it possible to get it either on-line (mp3) or off-line? I try to google for it but this kind of music seems to be quite rare. I am a long fan of the Goze and the biwa hoshi. I also found the Yoshida Brothers on youtube and they have become one of my favourites. thanks for the mp3's of the goze and for the wonderful pictures of a forgotten era in the memories of those of us in the West. how can i get a copy of those 2 cds of goze music? i absolutely love this stuff. There's something oddly potent about the preserved echoes of long-dead people, and this box offers five riveting hours of such things. 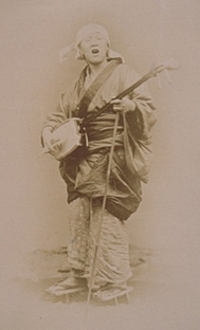 Like the last Japanese "goze", recorded in 1964: these blind women-minstrels, who accompanied themselves on the shamisen lute, formed a social institution in a region of Japan where eye-disease was endemic. Some music or traditions died out or were modified since they were collected. 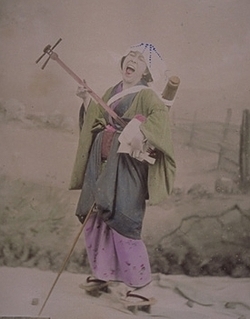 In Japan, the guild of blind women, known as goze, generally sang epics and accompanied themselves on the shamisen. In 1964, Eta Harich-Schneider recorded Sugimoto Kikue, who the government declared a national treasure. The last goze retired in 1977.